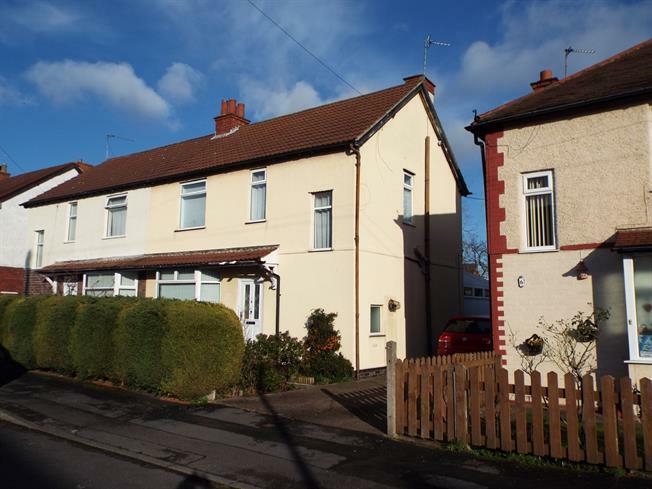 3 Bedroom Semi Detached House For Sale in Nottingham for Offers Over £205,000. This spacious three bedroom semi-detached home is perfect for first time buyers or a family! benefitting from two large reception rooms, extended kitchen and conservatory to the ground floor offering fantastic space. Upstairs their are three bedrooms and family bathroom. The property is fully double glazed and has gas central heating. Outside the property benefits from a shared driveway to the front, with large well-kept rear garden. The property comes highly recommendable for a viewing to appreciate the sheer size of the home. Call Bairstow eves, Beeston to arrange a viewing on 0115 943 1072. UPVC double glazed door. Double glazed UPVC window. Radiator and gas fire. Double glazed UPVC window. Radiator. Built-in units, one and a half bowl sink with drainer, electric oven, gas hob. Double glazed UPVC windows. French doors leading to rear garden. Double glazed UPVC window with frosted glass. Radiator. Standard WC, corner bath, shower over bath and electric shower, pedestal sink.